In the wild, a dog would look for caves or some other similar habitat to ensure safety. Even dogs that are used to bedding up with their owners will often paw at blankets or pillows, in a subconscious attempt to hollow out a hiding spot. 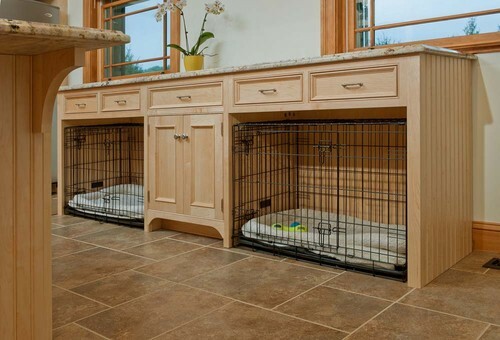 Whether you prefer bedding that has open access or you need a closed crate, these dog space ideas are sure to inspire. By far, one of the easiest way to have a secluded spot is to create one under a desk unit. A small dog’s crate can usually slide right under a desk. If the desk is frequently used by the dog owner, it will give the dog a secure spot that also allows them to be near their master. Even an open bed can provide that secluded feeling when placed under a desk. Here, the file drawers have been placed so that they create two separate areas under the desk top – one for the owner and one for the dog. Under cabinet crates are also a good method for providing a private space. They serve as a wrap around the crate, which gives that cave like feel while creating a neat built-in look. 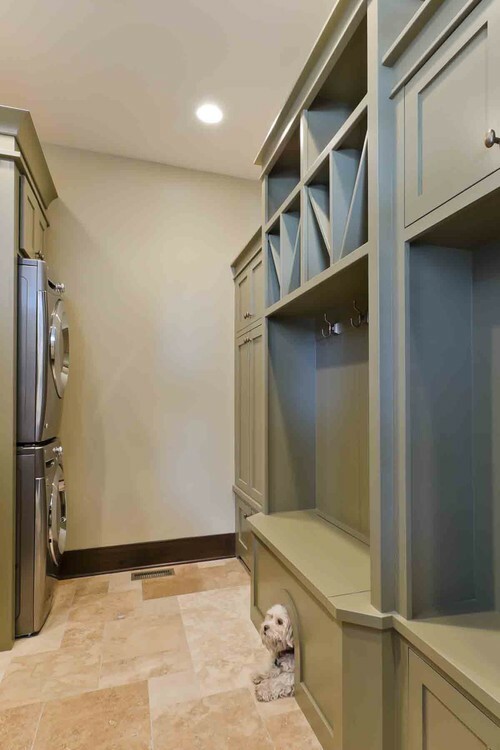 The drawers and side cabinets can also be the perfect place to store leashes, toys, etc. 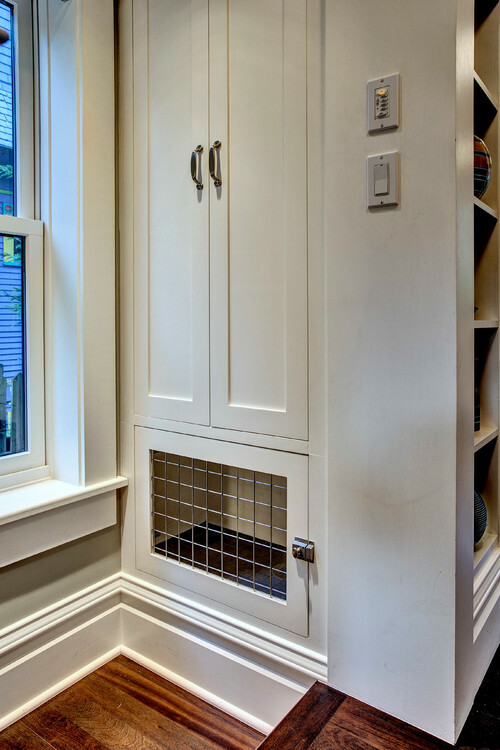 If you can swing it, a recessed area can be the perfect space for a dog. 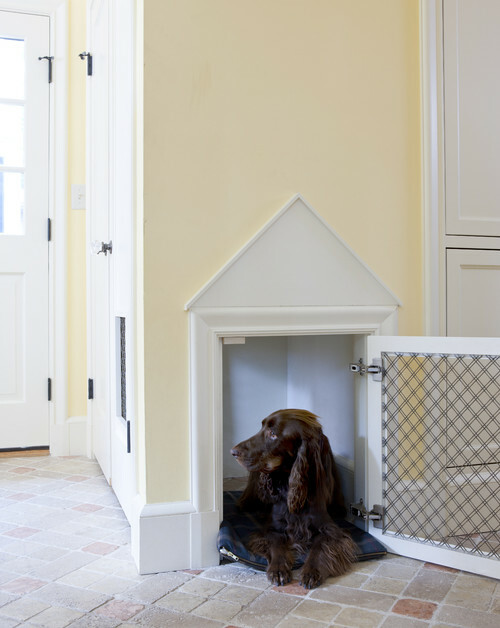 In these dog space ideas, a small area has been chiseled out in a wall. Here, the dogs’ bed has been lined and trimmed in knotty pine. 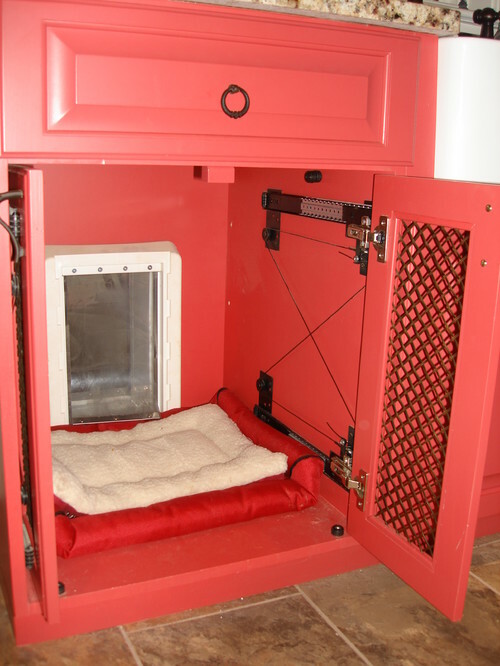 Here, part of a closet has been converted into a cozy little niche for the family pet. 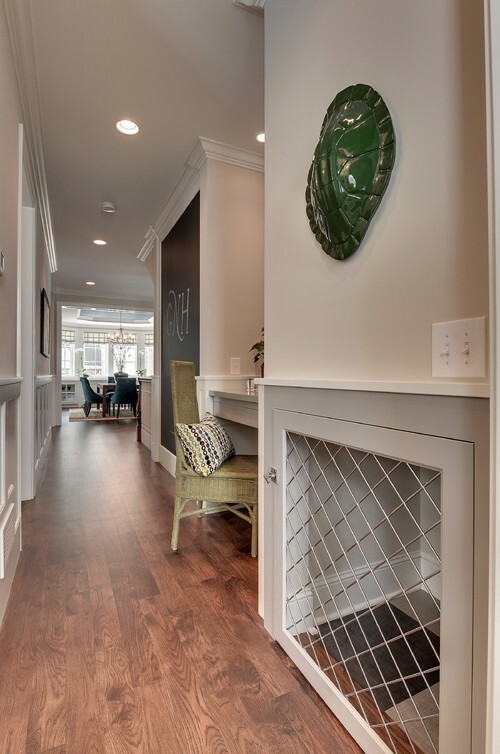 Notice that although the door has a glass insert, the closet door has a doggy door, which provides a second entrance/exit for the dog. (Dog areas like these require ventilation. Never use a glass or solid doors without having some other means to provide circulation or escape). 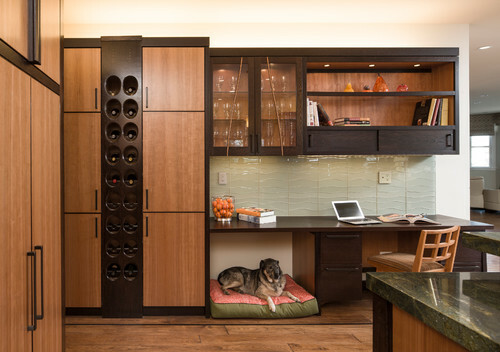 A good way to have a built-in dog space is to convert a book shelf or linen closet. The bottom drawers or shelves can easily be converted into a crate or open bed area. Here, the recessed space has been built-in next to the desk unit. It is also next to an exterior door. This allows for convenient potty time each morning. 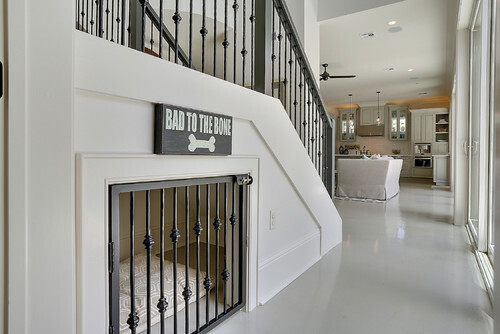 The crate door can be left open during the day to allow the dog/dogs to hang out with the owner during home office work. In a previous article, I went through the options for under the stair storage. One of those options was for a dog area. It is perfect for creating a dog area, because it is otherwise wasted space. It doesn’t take away from other storage in the house, but taps into an often ignored possibility. If you prefer an open area, this under the stairs bedding has thought of everything – pull out potty area and food dishes. This is the DIY section of the article, and what better demonstration of a great DIY than this cabinet. Doors have been converted to open metal inserts and placed on glides. Also, notice the doggy door at the rear of the cabinet. 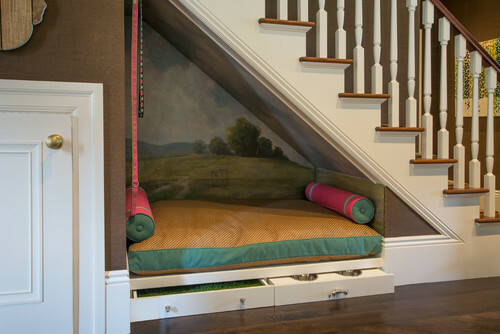 This is a great way to provide access to the outside or to another area of the house without the doggy door being obvious. 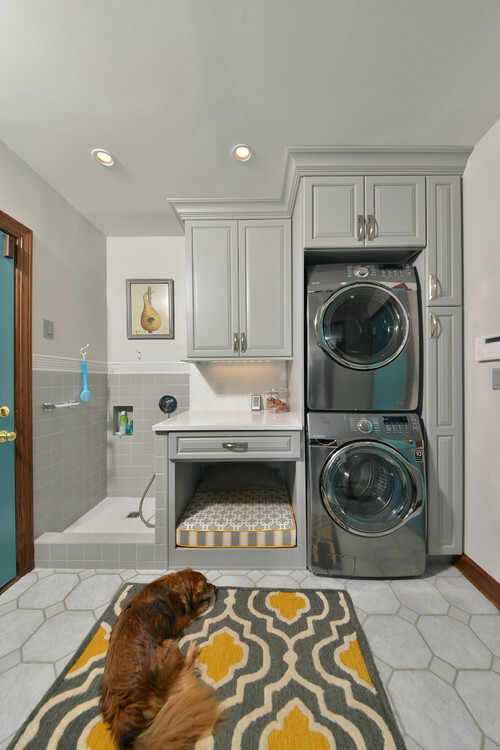 A very popular room to use for dog crates is the laundry room. 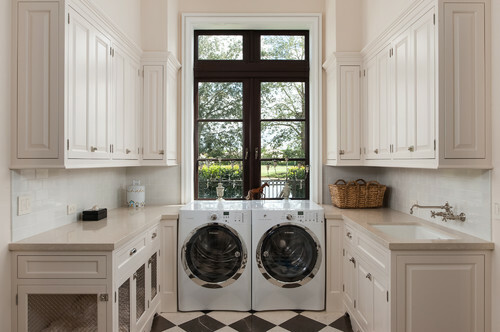 With the common use of tile for flooring and the addition of a sink, the laundry room is an ideal location for pets. Here, the lower cabinets have been converted into a multi door crating area. 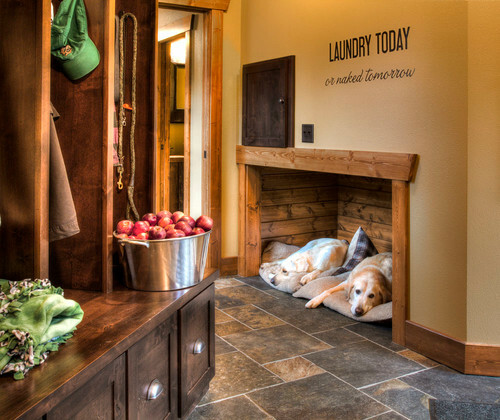 Here, the laundry room doubles as a dog grooming station with an open bed area below the station. In keeping with the laundry room/grooming station theme, this area is more ideal for larger dogs. The extra deep cabinet provides a good place for the dog to lounge while drying out. 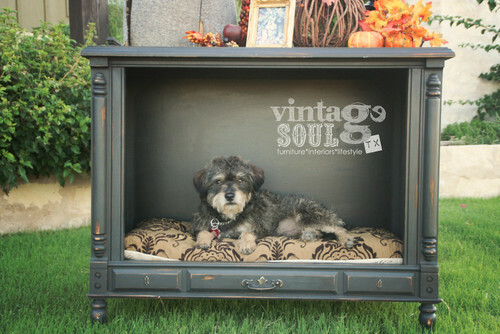 Dog Decor- Designing for Dogs!